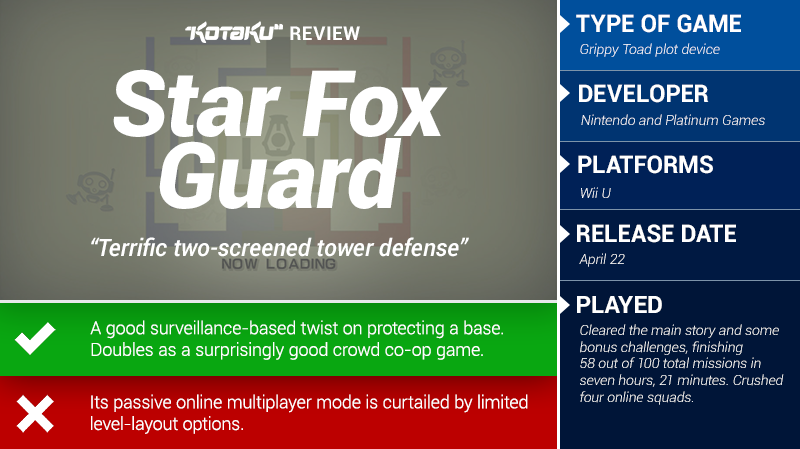 It’s barely related to the Star Fox series and has mostly been ignored in the year of hype leading to the release of its big brother Star Fox Zero, but the new oddball Star Fox Guard tower defence game from Nintendo and Platinum is well worth your attention. I think I was the first American games critic to ever play the game, back when Nintendo’s lead game creator, Shigeru Miyamoto, asked for a volunteer to try the game at a press event at E3 2014. I raised my hand and took the Wii U GamePad in hand. The rest of the attending press looked at the TV. On my GamePad, I could see an overhead map of a base, along with numbered security cameras that I could tap with a stylus. The TV, which the rest of the press corps and I could all see, showed the video feeds of all 12 security cameras, with a blown up display of the camera I had currently selected. As enemies streamed into my base, spectators would call out camera numbers. I would switch to them and shoot the enemies with the gun attached to each camera (of course every camera has a gun...this is a video game!). I could have played solo. I could have scanned all the camera displays on the TV with my own eyes, which is mostly how I’ve played Star Fox Guard for more than seven hours at home for the past week. But it helped to have spectators and to treat it as an oddly co-operative game. 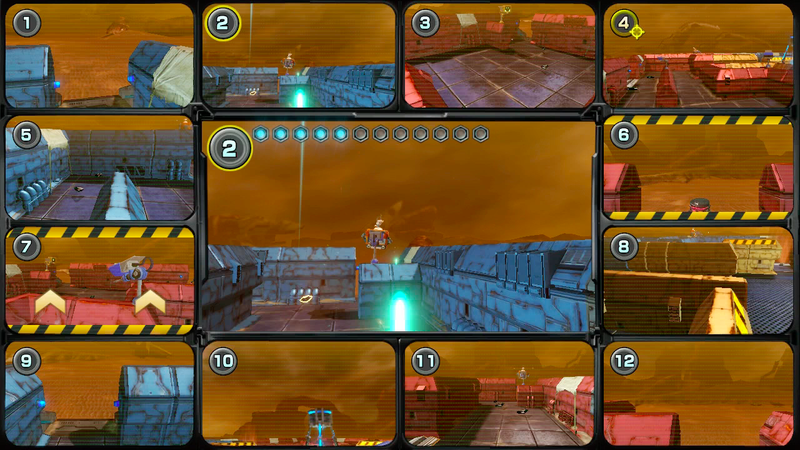 Star Fox Guard was called Project Guard back in 2014, and if it had difficulty levels then, it now simply has 50 main levels of increasing challenge and 50 more challenge missions that are even trickier. The tougher it gets, the better it is. The game’s story is silly, not that that any sane person would prioritise Star Fox Guard for its plot. Star Fox sidekick Slippy has an uncle named Grippy who runs a mining company whose facilities are constantly being attacked. Slippy enlists you to operate armed security cameras and manually shoot any invaders before they can reach the core of each facility. OK, whatever. This justifies the gameplay: the amusing invasion of chaos robots and combat robots from all sides of your base. 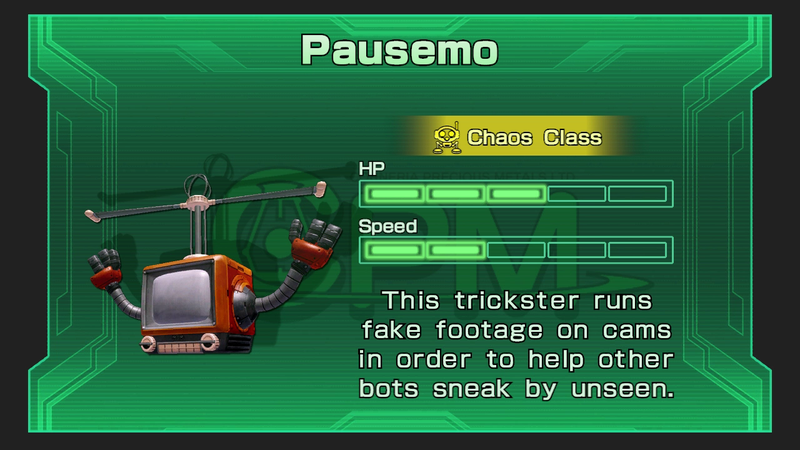 Chaos robots are the game’s trolls. They will not defeat you, but they’re there to annoy you until you shoot them (PSA: Don’t shoot trolls in real life. Just ignore them. And avoid feeding them.). The minor chaos bots trundle toward any one of your cameras, blow up and temporarily knock out that camera’s feed. One chaos class bot is a walking box fan that wafts air toward a camera to redirect it. Another type looks a little like Big Bird and affectionately plucks cameras off the walls and walks away with them. I was amused by Pausemo, the airborne TV that flies in front of one of your cameras and airs fake footage in front of its lens. Burning question: Is this robot’s name better if it is pronounced with two syllables or three? The game does not indicate either way. The mission starts easily enough. I take out a bird on camera four, a fan on camera 12 and a gorilla on camera one. Things get tougher about 45 seconds in when a shielded combat bot shows up on camera four. That’s where you can see one of the better aspects of Star Fox Guard’s design. I can’t kill that bot using the gun on camera four, but I realised by looking at the level layout on the Wii U GamePad that I could shoot at the vulnerable side of that bot using camera 12. So I switched to 12, aimed and blew it up. It’s a little tough to see in the footage but at a minute in, one of the bird bots plucks my camera away (look for the hearts of affection). A few seconds later, I shoot the bird with a different camera and then use my stylus on the GamePad to place camera 10 back on its wall. The action gets more intense as more enemies flood in. Right when I’m on the verge of losing, I win. It’s a nail-biter and a very satisfying win. Star Fox Guard is best played in short doses, a few missions per sitting. Each only takes a few minutes and isn’t different enough from the ones before it to make the game constantly feel fresh. 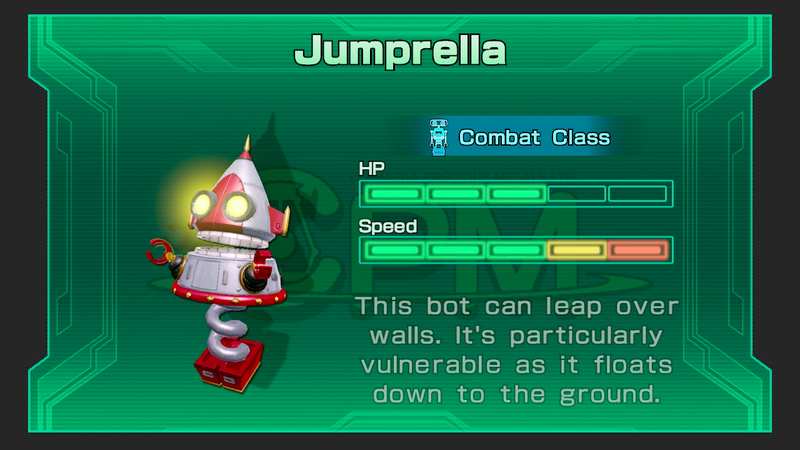 Steadily, though, the game introduces more and more enemy types and more complex facilities to defend. Later levels have added hazards, including foliage that obscures your cameras’ lines of sight and switches that let invading bots turn your base’s lights out. I only started failing missions frequently when I was in the last 10 of the game’s main 50 challenges. I then poked around at the game’s 50 bonus missions and found the restrictions in those levels satisfyingly challenging. Some limit the number of shots you can fire. Some drop enemies from the sky. A “survival” mission variant doesn’t allow your cameras to fix themselves, leaving you with fewer and fewer working displays and guns as the enemies stream in. Enjoyable chaos: A Pausemo TV bot hugs camera five, making it show fake footage. But it can be shot down from camera two. Camera seven displays an alert indicating that a UFO is approaching to steal it away. A spy bot slips in past camera six. The game may spark some thoughts of the popular surveillance camera horror game Five Nights At Freddy’s, but its passive online multiplayer mode should also inspire comparisons to the mammoth mobile hit Clash of Clans and its many clones. Players can share their own remixes of levels, challenging all comers to try them online. 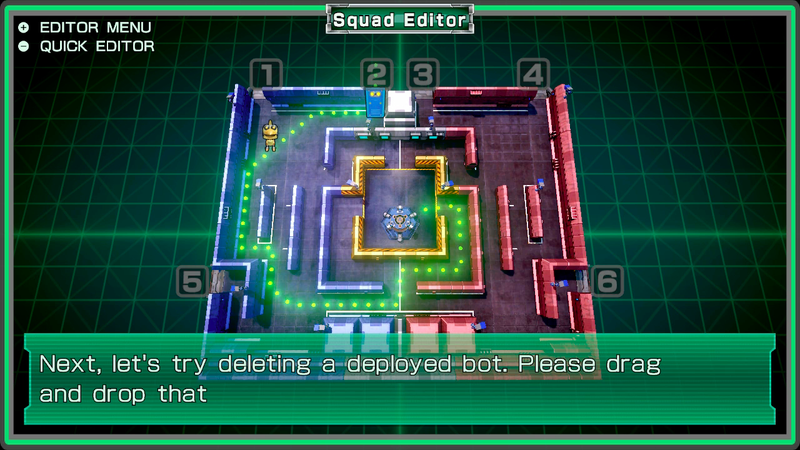 Using a simple editor, you can open up a level, place bots and lay out attack patterns, then upload the level to Nintendo’s servers for other players to defend against. You can also download others’ configurations and try to defend against them. This competitive mode is a good idea that worked for Clash of Clans and will work for Guard if the options given to players are sufficiently robust. I’m sceptical that they are and haven’t been impressed with the few online levels I’ve tried. The game lets you place enemies and pick routes for them, but it doesn’t let you reshape levels or draw them from scratch. That omission is inexplicable given the level-construction allowed in Wii U hit Super Mario Maker. It is possible, though, that the players whose levels I’ve tried and breezed through simply hadn’t unlocked enough of the game’s tougher bots or weren’t sufficiently skilled at placing enemies. As the game gets officially released later this week, I’m hopeful to see tougher, more interesting player-crafted layouts. I’m also eager to see how people fare against mine. As you play the main game, you unlock more levels and more options to improve your cameras. You’ll soon be able to make one or two of them freeze enemies or target groups. That’s handy but is also another indicator that the game is over-designed for the content on hand. The opportunity to prep for any mission to manually move cameras from their default placements and to soup up one or two is obviated by the fact that the default camera positions are always perfectly fine and the best strategy for using special cameras seems to always be putting a slow-mo camera near the centre of your base. It’s possible that the game’s tougher challenge levels require more careful use of those options, but I’ve cleared more than half of the game’s 100 missions without ever feeling the need to deviate from the default camera placement. I almost always now stick a slow-mo camera in the centre. The core gameplay of Star Fox Guard is nevertheless very good, very satisfying and very fun to play solo or with a person nearby shouting camera directions. The worst knocks on the game can be solved with more levels, perhaps an iterative sequel on Wii U or the 3DS. To get to that, though, gamers would have to show support for this oddball project, which Nintendo is presenting in a peculiar way as a bonus disc with Star Fox Zero or easily missed curiosity. Given that the game has just about nothing to do with the aerial shooting gameplay people associate with Star Fox, it might easily be skipped or missed. It shouldn’t be. It’s one of Nintendo’s most distinct games in years, one that makes great use of the Wii U for a fun, distinct solo or co-op experience.